More than once I have written that I’m a fan of old-fashioned pulp fiction so I knew this would likely be right up my alley. I was familiar only with the basic premise of Captain Future and that it was generally written by Edmond Hamilton. What author Allen Steele has done is provided the reader with back story – or the origin story, if you will. Curt Newton’s mother and father were murdered when he was a child. He has been raised in a hidden bunker on the moon by a robot, an android, and the brain of Professor Simon Wright – a family friend. These three oddities teach and train Curt so that he is the best possible human. He is also raised with a strong moral code to do what is right and protect the innocent. When Curt learns that his parents’ killer is a corrupt businessman and current Senator, he makes it his mission to get out and avenge his parents and to bring down the politician. He creates the persona of ‘Captain Future’ and with the help of his three unique friends (the robot, android, and disembodied brain) begins his adventure. Along the way, he meets Inspector Joan Randall of the Interplanetary Police Force. He’s never met another human before this, and the fact that she’s quite beautiful has him feeling awkward and tongue-tied around her, though he tries valiantly to play up his Captain Future do-gooder persona. Joan finds him silly, but charming and attractive with his innocence and as she’s also trying to right wrongs in the galaxy, she teams up with him. Together they discover that there’s a web of conspiracy that runs deep surrounding the Senator and bringing him down won’t be an easy task. Author Allen Steele is clearly knowledgeable of the pulp genre and has taken on this story with the skill of a practiced writer and the enthusiasm of a fan.. He has written the ‘origin story’ of Captain Future (which lines up with his origins as described in Wikipedia). Writing pulp fiction for the modern reader is no easy task, and taking a hero from the 1940’s pulps and making him interesting and relevant to today’s reader is a challenge. But it’s a challenge that Steele has taken on and done very well. I’ve only read a small amount of Edmond Hamilton (the author of Captain Future books in the 1940’s) and nothing of this particular hero, so I can’t really compare, but this book has encouraged me to seek out some of the original Captain Future stories and that alone speaks highly of how interesting and exciting this book was. I hope that this will lead to more Captain Future volumes with Steele at the helm. Looking for a good book? 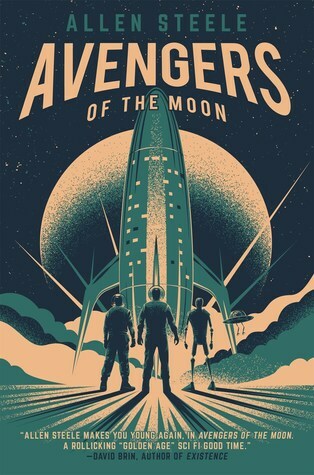 Avengers of the Moon by Allen Steele is a modern story of a classic pulp hero and has all the excitement and adventure of the classic pulps but will engage the modern reader well. I received a digital copy of this book from the publisher, through Netgalley in exchange for an honest review.